Here is a better picture of the blooms of Mexican Sage Geranium. It began blooming on April 13. Each cluster of blooms is like a tight little nosegay. 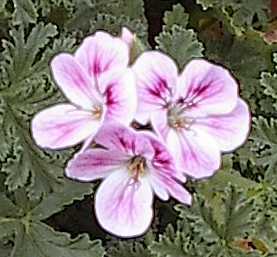 Each petal is light pink in the center with darker pink streaks. The outer edge of the petal fads to white.